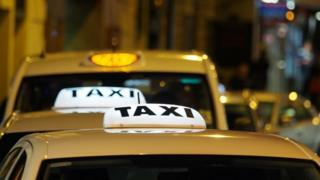 A taxi driver accused of behaving like a "stunt driver" told a court his Irn Bru drink was spiked with ecstasy. Tracey Paleford, 48, said she feared for her life when cab driver Ross McNair drove her to a Glasgow gym in November 2017. The passenger told Glasgow Sheriff Court the 42-year-old missed other vehicles by "a split second." Mr McNair, from Condorrat, denies dangerous driving and being unfit to drive through drink or drugs. Miss Paleford was being driven to DW Fitness at the Glasgow Fort in Mr McNair's white Seat Toledo. Witnesses claimed to have seen his car swerving about and driving towards oncoming traffic on the wrong side of the road. Miss Paleford said she asked "Are you a stunt driver?". She said: "I thought it was a wind up as it was like a survival mission. "He was driving on the wrong side of the road as if it was the right side of the road for him, he missed other vehicles by a split second." Epilepsy sufferer Miss Paleford, believes the incident caused her to have a seizure when she got to the gym. She told the court: "He said he didn't want any money and I ran into the gym and had a massive fit after that." Another witness, Scott Henderson, 36, called the police after seeing McNair driving on the wrong side of the road close to the shopping park. He said: "The car was all over the road, there was a lady who looked irate jumping up and down." Mr Henderson, who was picking his son up from the Fort, called the police who caught up with the taxi close to where the M73 and M8 motorways meet. Mr Henderson handed over images of the driving captured by his son. McNair's lawyer said McNair believed that his can of Irn Bru was spiked and the trial was adjourned to allow the can to be forensically analysed. PC Mark Tweddle - who dealt with Mr McNair by the roadside - claimed McNair said he "took too much medication" and added: "There was no sign of any can, as it would have been confiscated." The court heard that a few days later, an attempt was made to hand in a can of Irn Bru at London Road police station. PC Tweddle said: "He did try to hand in the can at London Road police station and they refused it." The can has since been sent off for forensic testing.